Farmers can optimize harvesting procedures and improve yields, food manufacturers can improve planning reliability. Information systems specialists at Saarland University are working to optimize the entire potato production chain, from field to fork. 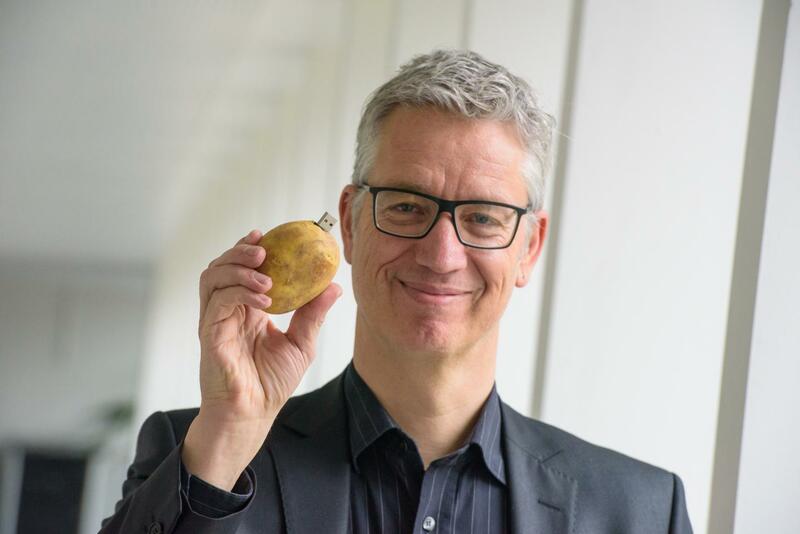 When it comes to the world's most popular tuber, Professor Wolfgang Maaß and his team are aiming to make all of the processes totally transparent. Starting with the farmer out in the field, Professor Maaß' team can offer forecasts that assist the decision-making processes. To provide these services, the team has built networks filled with data and information on topics as diverse as agricultural machinery, price forecasting and how often and how hard potatoes get knocked on a conveyor belt – the latter data being collected by harvesting an impact-sensitive artificial potato. The research team will be exhibiting their information system at Hannover Messe from April 23rd to April 27th (Hall 2, Stand B46) and are looking for partners with whom they can develop practical applications. Modern potato harvesting can be a pretty rough business. In years gone by, the farmers would be out in the fields assisted by friends and family carefully digging up the potato crop by hand. Today, mechanical harvesters are in use. But if the machinery is not adjusted correctly, the potatoes can get badly bumped and knocked as they move along the agitator belts, hitting stones and each other on their way. This can cause bruising of the delicate potato tubers, which in the worst cases can lead to significantly reduced yields. 'If the farmer knows early on that the potatoes are suffering too many mechanical knocks, he or she can respond in time, by adjusting the speed of the harvester or by increasing the amount of soil on the belt,' explains Dr. Sabine Janzen, a research assistant in Prof. Maaß' group. But this all relies on the farmer getting the information when it is needed, i.e. during the harvesting process out in the field. This is where the information technologists at Saarland University and at the German Center for Artificial Intelligence (DFKI) play a role. Their research focuses on delivering 'smart services' to different business sectors, and the potato project is part of the 'smart farming' initiative for the agricultural sector. 'Our research involves analysing data within the Industry 4.0 framework with the aim of drawing economically relevant conclusions for sector stakeholders. The agricultural sector still works in a very traditional manner. Despite widespread use of modern technology and digitalization, the data is not being analysed to identify potential benefits or to optimize the processes involved,' explains Wolfgang Maaß. His research team is now helping to make the potato and its journey from field to factory completely transparent for all stakeholders – from potato farmers and suppliers to food manufacturing companies and commodity traders. 'We examine what data is being generated and whether and how we can analyse it to draw meaningful conclusions and make useful predictions. We can, for instance, calculate what the product losses would be if a machine operator continues to run a piece of agricultural machinery in a particular way and we can provide farmers with this sort of information in real time,' explains Maaß. 'To produce forecasts we also make use of other information, such as financial data. If I know how the global market is developing, I can make real-time predictions of future yields,' he explains further. This involves creating what is known as an 'Asset Administration Shell', which can be thought of as a kind of logbook containing as much information as possible about a particular batch of potatoes. One of the parameters examined by the research team is potato damage during harvesting. To get relevant data on this, the team uses a sensitive artificial potato to determine how many times a potato gets knocked. 'For the field studies, we make use of our sensor-equipped "nPotato",' says Sabine Janzen. The potato harvester harvests the nPotato, which then takes the same route through the machine as its naturally grown counterparts. The sensors in the nPotato allow it to register impacts and rotations. If the artificial potato is being thrown about too much, warning signals are issued. 'To link physical and virtual objects, to classify the different types of impact occurring and to draw useful conclusions, we use deep learning methods in combination with other IT and communications technologies' explains Janzen. The researchers are able to mesh together large amounts of disparate information: When and where was the harvest? Which variety of potato was harvested? What is the water content? What is it suitable for? The team also draws on pricing information and financial forecasts, and will in future be expanding their model to include historical data, last year's harvesting process data, data from weather forecasts and expert knowledge from farmers and agronomists. Using these techniques, they have been able to create a service platform for everyone with an interest in the humble spud. The platform can help farmers identify the best time to bring their produce to market, or decide whether the quality of the crop is suitable for a gourmet restaurant or is better off being used for potato starch. The platform can also help optimize the settings of factory machinery, such as determining the thickness of the peel to be removed. And commodity traders can use seals of quality to protect their investments. 'If we combine and analyse the data from several farmers, other kinds of forecast are possible. If, for example, predictions show that the quality of the harvest for one variety of potato is likely to deteriorate in the foreseeable future, companies that make, say, French fries could switch to another variety to avoid production problems,' explains Professor Maaß. Press photographs are available at https://www.uni-saarland.de/aktuelles/presse/pressefotos.html and can be used free of charge. Please read and comply with the conditions of use.